Last month, as much of Colorado was enduring a snowstorm, hundreds of crabs in Fort Collins were enjoying more pleasant conditions: 75-degree heat with 80 percent humidity. 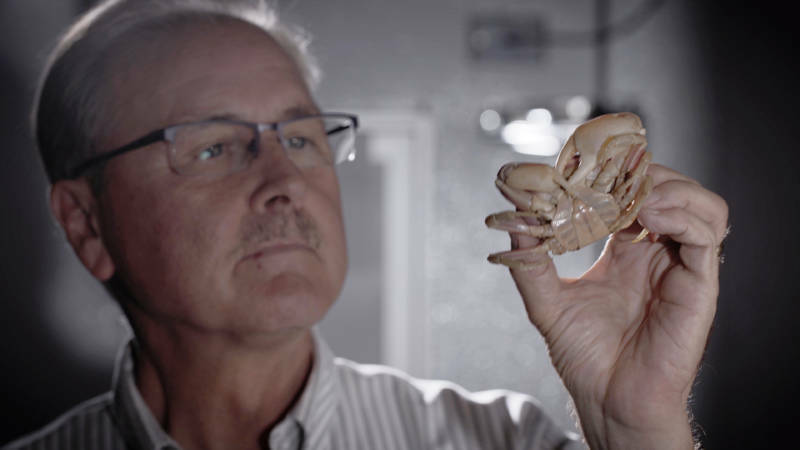 In the “Crab Lab” at Colorado State University, crustacean biologist Donald Mykles houses a population of blackback land crabs, natives of the Caribbean, in an environment that mimics their tropical habitat. Research in the Crab Lab focuses on molting, the process that allows crabs to shed their hard shells when the soft body inside grows too big for its britches. Scientists have long studied molting, but what exactly controls it has remained somewhat mysterious. Mykles’ research examines how molting might be manipulated, in case we ever wanted to, say, engineer a fast-growing variety to feed the world’s appetite for shellfish. Crab is a $700 million industry in the U.S, the second-most valuable seafood menu item after lobster. The chief crab food species are blue crab on the East Coast, Dungeness in California, and king crab in Alaska. 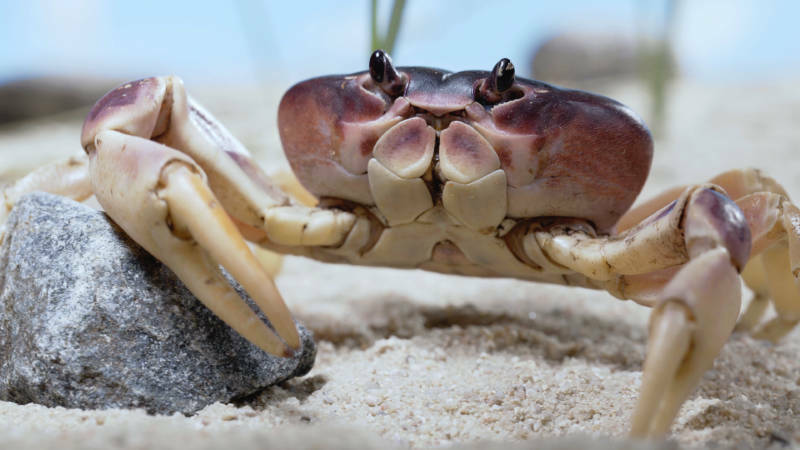 Since all crabs share a basic molting mechanism, Mykles’ work with the blackback land crab -- which is not a major food source, except in some Caribbean stews -- is transferable to the more popular commercial species. Besides trying to build a better crab, Mykles hopes to understand how rising ocean temperatures and acidity, both associated with global climate change, might play a role in crabs’ ability to keep up with their popularity as a menu item in the future. These environmental factors could affect new shell hardening after a molt, he said. Increasing levels of carbon dioxide in the atmosphere mean more of the gas becomes dissolved in the ocean, especially near the surface where crabs live. In water, carbon dioxide becomes carbonic acid, which breaks down crustacean shells. Warmer temperatures accelerate these reactions. The more imminent climate-change worry with crabs is about the plankton that make up their diets. These single-celled organisms are the source of the calcium carbonate critical to shell formation and are more vulnerable to changing ocean conditions. Unlike their tastier cousins, Mykles’ blackback crabs spend most of their lives on land. Females return to the sea only briefly to lay their eggs. On the sand-dune beaches where they live, the males do constant battle over territory. The stakes are high: If one of these baby-faced crabs secures a winning spot, he can invite a mate into his den, 6 or 7 feet beneath the surface. With all this roughhousing, more than feelings get hurt. “These crabs are not very nice. They live in large colonies. They attack each other, and they’ll eat each other,” Mykles said. The male crabs inevitably lose limbs and damage their shells in constant dust-ups. Luckily, like many other arthropods, a group that includes insects and spiders, these crabs can release a leg or claw voluntarily if threatened. It’s not unusual to see animals in the field missing two or three walking legs. The limbs regrow at the next molt, which is typically once a year for an adult. When a molt cycle begins, tiny limb buds form where a leg or a claw has been lost. Over the next six to eight weeks, the buds enlarge while the crab reabsorbs calcium from its old shell and secretes a new, paper-thin one underneath. In the last hour of the cycle, the crab gulps air to create enough internal pressure to pop open the top of its shell, called the carapace. As the crab pushes its way out, the same internal pressure helps uncoil the new legs. The replacement shell thickens and hardens, and the crab eats the old shell. The clues about how to produce molting on demand have been stacking up for decades. It turns out that the control center lies in an unexpected place: the crab’s eyestalks, where a master nerve cluster like the human pituitary gland orders up a cocktail of hormones from an array of secondary glands. 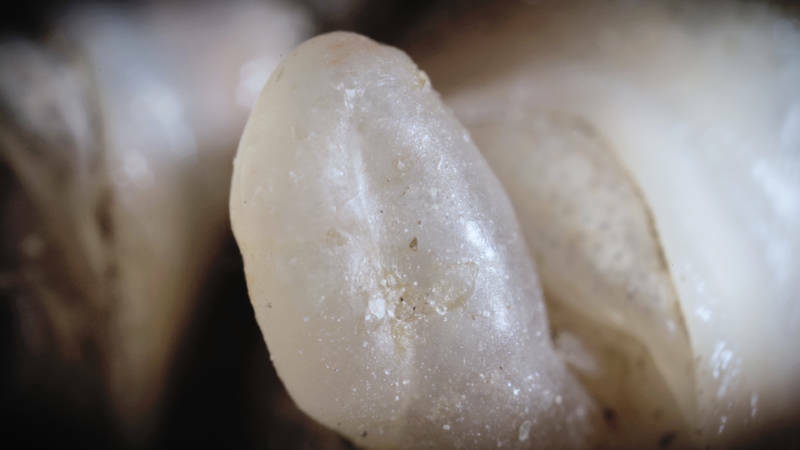 Because of the location of this so-called X-organ, identified in the 1950s, Mykles and others have guessed that visual cues, like the number of nearby crabs or the length of daylight, could play a role in determining when it’s time for a change of shell. What’s more, the hormones from X-organ don’t induce molting -- they prevent it. Without the enzymes that keep molting in check, a crab would be constantly cycling through new shells. Such unbridled molting is fatal to a crab -- after a few rounds, they get stuck trying to get out of the last shell. In the 1970s, Dorothy Skinner at Oak Ridge National Laboratory in Tennessee hit on something else. Despite its very small brain, the blackback can count, at least when it comes to its legs. Consistently, her research found, if a crab loses five legs or more, molting starts ahead of schedule. While these discoveries relied on classic scientific approaches, such as behavioral studies, the current work in the Crab Lab employs newly developed gene-based tools. In particular, High-Throughput Sequencing or HTS, which tracks which crab genes are most active at different points in the molt cycle, is opening a lot of avenues of research.